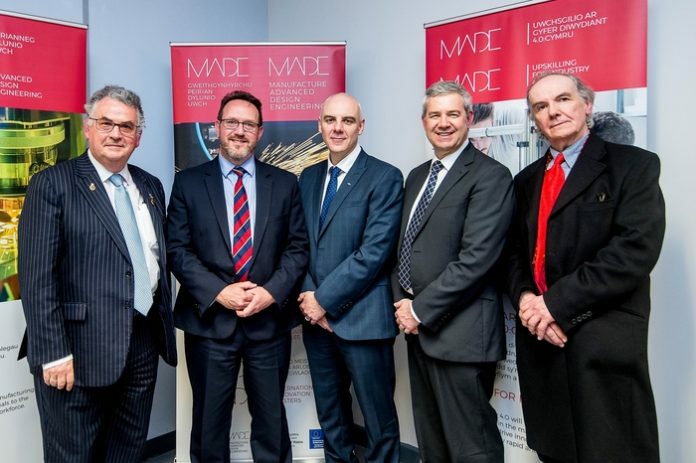 Leaders in Welsh manufacturing gathered at Ford’s Bridgend Engine Plant on Friday, April 5, to welcome the launch of the MADE (Manufacture for Advanced Design Engineering) project. This suite of EU-funded projects, being delivered by the University of Wales Trinity Saint David’s (UWTSD) Centre for Advanced Batch Manufacture (CBM), is designed to collaborate with SMEs within industry to future-proof their operations, by upskilling and by adopting advanced manufacturing technologies. UWTSD Deputy Vice-Chancellor, Professor Robert Brown, says: “We are very pleased to launch the MADE project at one of the key manufacturing sites in Wales – Ford’s Bridgend Engine Plant. These are challenging times for manufacturing in Wales, with a number of uncertainties ahead. The on-going Brexit process will usher in economic shifts, we are seeing rapid changes, relevant to manufacturing, unfolding in the world of technology, and there are underlying evolutions in play as far as working patterns and staffing is concerned. Mark Thomas, Manufacturing and Plant Engineering Area Manager, based at Bridgend, says: “It is great to see the MADE project coming to fruition in Wales and we would urge forward-thinking business leaders to embrace the opportunities it offers. It is important that business owners do all they can to ensure their operations are nimble, modern, and that they pre-empt such shifts rather than simply being reactive and playing catch-up. UWTSD Vice-Chancellor, Professor Medwin Hughes said: “The University is pleased to launch the MADE project at the site of one of the country’s key employers. UWTSD has a long tradition of working in partnership with industry, delivering programmes and working in collaboration to meet their needs. The programmes offered through the MADE project will enable us to work with the manufacturing sector to respond to the technical challenges of the fourth industrial revolution and to support the sector to maximise the opportunities offered through such innovation.